* Starts with a fresh citrus blend – orange, lemon, bergamot, and neroli. * As usual, the citrus doesn’t last long, maybe 20 minutes. * The scent becomes really faint, and if I sniff my wrist closely I get a hint of light resins and mint. * Somehow the scent turns around and comes back a little stronger with some boozy resins. * It calms down again really quickly and lasts a little bit longer as a sheer skin scent. Summary: Honestly, I am very disappointed with Rive d’ambre. One of the original Tom Ford Private Blends – Amber Absolute was a masterpiece of incense and amber which kind of inspired the start of my fragrance journey. It has since been discontinued. For the Atelier D’Orient collection, the amber is a lot more toned-down, quiet, and possibly apologetic. When you see Tom Ford ads – they are brazen, aggressive, and make a statement. Rive D’ambre says next to nothing. Although it’s an EdP, it wears like an EdT lasting barely 4 hours on the skin (and most of that as a sheer skin scent). 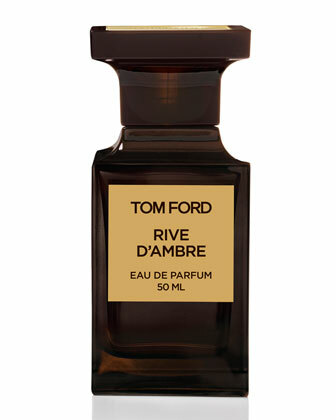 If you are really meek and shy and afraid that your fragrance might be too strong, then check out Rive d’Ambre. Honestly, you can find much better for 1/3 to 1/4 the price. Tom Ford Private Blend fragrances are available at Saks 5th Avenue and Neiman Marcus. Disclaimer: Sample provided by sales associate for review. Image courtesy of Neiman Marcus. When I see “ambre” in a title, I assume that it would smell like amber and not like lemons. In the line, two are not bad and two are not good. This one is not good. Not a fan of this one either.